Dr. Munish Gairola , MD DNB Radiation Oncology with over 23 yrs. of experience in the field of oncology. He completed his MBBS from G.S.V.M. 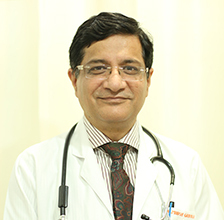 Medical College, Kanpur, MD from Kanpur University and subsequently worked in Post Graduate Institute of Medical Education & Research (PGIMER) Chandigarh and All India Institute of Medical Sciences (AIIMS), New Delhi for several years. He worked in Christie's Hospital, Manchester, UK as clinical fellow and IMRT Fellow at Memorial Sloan Kettering Cancer Centre (MSKCC) New York, USA. He has also received UICC fellowship for National Defence Medical College (NDMC) Saitama, Japan. Dr. Gairola has published many articles in various International and National Journals. Presently Dr Munish Gairola is working as Director Radiation Oncology at Rajiv Gandhi Cancer Institute & Research Centre (RGCI & RC), Delhi. Grant from UICC & Norwegian Cancer Society Grant to Attend 18th UICC Congress held At Oslo, Norway June /July 2003. Cancers of Head and Neck. In Gaura K Rath, Bidhu K Mohanti (Eds) Text Book of Radiation Oncology- Principles and Practice. B I Churchill Livingston Pp 131-199. Paediatric Oncology. In Gaura K Rath, Bidhu K Mohanti (Eds) Text Book of Radiation Oncology- Principles and Practice. B I Churchill Livingston Pp 669-720. Brachytherapy In Soft Tissue Sarcoma. Intravaginal Brachytherapy by Ovoids to Control Vaginal Bleeding In Cervical Cancers. Should The Haemostatic Dose Be Disregarded ? 1993- 1993 - CLINICAL RESEARCH FELLOW At Christie's Hospital Manchester, U.K.